Our series on what went viral in 2014 (so far). On 15th April a sleepy town in Northern Nigeria woke up to witness a night filled with atrocity and horror. Dozens of heavily armed terrorists, belonging to an Islamist group called Boko Haram (which in the Hausa language means “Western education is a sin”) attacked the town, set the houses and a girls' boarding school on fire. They kidnapped nearly 300 schoolgirls as a punishment for pursuing “western education”. The news unfortunately didn’t get attention for the next 3 weeks – until 2 tweets that brought the world’s attention to the heinous and atrocious act. The origin of the hashtag campaign #Bringbackourgirls which exploded on all social media platforms can be traced back to an April 23 event honouring Port Harcourt as UNESCO's 2014 World Book Capital City where Oby Ezekwesil, Vice President of the World Bank for Africa, demanded the release of the girls saying “Bring back our girls”. 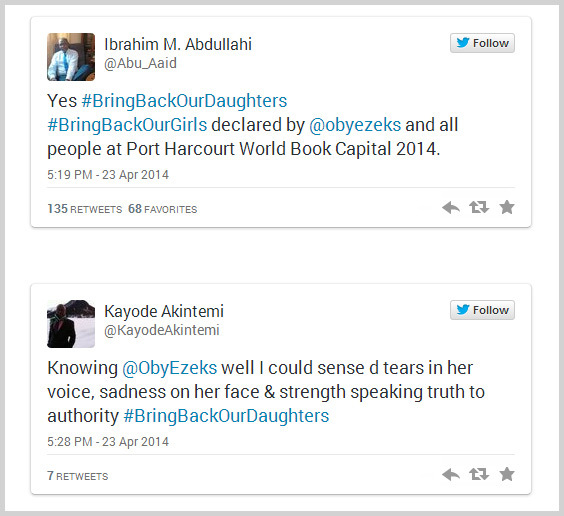 Two attendees tweeted her remarks with the hashtags #BringBackOurGirls and #BringBackOurDaughters. On April 30, the news of the girls being sold at a price of $12 and some being forcibly married to the militants broke. The news spurred angry reactions from tweeps across the world – from Chris Brown, Hilary Clinton to Michelle Obama and David Cameron adding their voice to the campaign. #BringBackOurGirls has been used on Twitter more than 1 million times. It’s no more a Nigeria-based campaign trying to bring attention to the missing girls and the plight of their family but has turned into a global social media campaign that’s forced the leaders in Nigeria as well as the other countries to take action and bring the girls back to their families. A huge hit on Facebook and Twitter, the First Kiss video is the proof that content that elicits a strong emotional response enjoys a greater shareability quotient. What happens when Spiderman comes fact to face with his mini-sized doppelganger? To know the answer watch the Evian Spider Man video which in a super cute manner leveraged the buzz surrounding the superhero film The Amazing Spider-Man 2. With over 18 million views the ad has cuteness written all over it. During the second phase of the campaign, the brand took to Twitter asking its followers to share their problems with the hashtag #AmazingBabyRescueMe. The out-of the-box advices (in form of tweets, vines) came from none other than baby Spidey, who even advised Miley Cyrus! It’s not only Suarez who craves Italian! Much before the World Cup ‘Suarez bit me’ incident happened Fiat’s Godzilla commercial gave us an insight into the giant lizard’s fancy for Italian cars. The commercial starts with a red Fiat running through the streets hit by the wrath of Godzilla. And then suddenly the monster appears and gulps the Fiat down its throat. The next scene shows Godzilla picking another tiny Fiat car and devouring it. A helicopter-perched soldier notes “It looks like he’s craving Italian!” Its next treat is a Fiat500L (a larger version than the regular two-door version); all the 5 passengers in the car are shocked and screaming for their lives. The oversized-lizard puts the car inside its mouth but within a fraction of seconds the monster spits it out. And then comes the tagline “It’s a lot bigger than you think” tagline. With 7 super hit World Cup campaigns, Nike is successfully tapping into the craze surrounding football’s biggest tournament. The ads starring Cristiano Ronaldo, Neymar and Wayne Rooney remind “players in every country at every level: If you are prepared to Risk Everything, there’s no telling what you can do.” The Last Game ad ( which stars animated versions of Cristiano Ronaldo, Wayne Rooney, Neymar Júnior, Zlatan Ibrahimović, Andrés Iniesta and many more stars) released on June 9 has already amassed over 60 million views on You tube and is the most shared post on Nike Football’s Facebook page. Well that’s not all! One of the campaigns titled - Winner Stays has generated more than 84 million views. In total, the 2 campaigns have racked over 372 million digital views. Nike says till date they’ve received 22 million campaign engagements. It’s official – aliens have come and everyone is faced with imminent catastrophe. Only one thing can now save us – a game of football. The 4-minute TVC featuring the biggest names in the world of football, such as Lionel Messi, Wayne Rooney, Cristiano Ronaldo, promotes Samsung Galaxy S5, Gear and Fit. The ad shows the players going through a rigorous and high-tech training to save the world from the aliens. All through the training the players wear space suits and check their fitness quotient on Samsung devices which come with features like heart rate monitoring, faster auto-focus and other dedicated fitness tools. The ad doesn’t mention World Cup, though, but the timing of its release before the big game can’t be a mere coincidence. The ad in its first week of release had racked 13 million views and there’s no stopping its popularity. At the time of this writing, the video has been watched over 54 million times on Youtube. The campaign features football stars including Messi, Dani Alves and Kanye West’s new track; it has been viewed over 37 million times on You Tube. The message is clear – to win the World Cup there’s only one way to play and that’s ‘all in’. The video ends with 2 boxes – one saying ‘all in’ and the other ‘nothing’. Clicking on the ‘all in’ box leads the user to a website where one can follow Adidas and stay updated with its world cup activities. And those who click on the ‘nothing’ box are led to a blank website – implying that Adidas won’t be sending any updates to the users. The campaign is Adidas’s biggest ever campaign in terms of media spend. It’s believed that its budget exceeds £50m mark. The video produced by Save the Children highlights the Syria crisis and depicts how such a scenario could affect Britain. The video finishes with a hard-hitting message - "Just because it isn't happening here doesn't mean it isn't happening." The 90 second awareness campaign, which has clocked up more than 31 million views on Youtube, documents a British kid's journey from one birthday to another : from celebrating her birthday with friends and family to surviving the horrors of war and ending up in a refugee camp on her next birthday. The video features Coleman, the first deaf offensive player to ever participate in the NFL. He uses Duracell’s batteries for a hearing aid so he can hear Seattle's fans. It’s a story of perseverance in the face of rejection and hostility. The story narrated by Coleman gives the viewers an insight into his journey so far- he was bullied as a kid; his coach didn’t know how to communicate to him; selectors rejected him. But what tugs at our heartstrings is his never-quit attitude. The video has been watched more than 25 million times on Youtube and Facebook. How to make new friends? Try a bottle of coke that comes with a specially-designed cap. The ad features a bunch of college freshmen at the start of the year who badly need something to break the ice. To help them start conversations with other students on the campus, the brand put a bunch of coke bottles on a campus. To open a bottle one had to fit the cap with that of another bottle – students had fun interacting with others as they opened the bottles. Over 7 million views – It’s sweet, endearing and leaves you with a smile. Earning more than 19 million views and over 205,000 social engagement (shares, likes, tweets and comments), the P&G ad was awarded a gold medal by ad analyst firm Ace Metrix for most effective Olympics ad. The ad shows moms picking up their kids after every fall – from helping their toddlers walk to standing with their kids all through their journey of falling while skiing, snowboarding or skating. The video ends with a strong message “For teaching us that falling only makes us stronger. Thank You Mom.” It also topped Unruly’s list of Sochi 2014 Winter Olympic spots with the most social shares. On Earth Day this year, NASA asked people -“Where are you on Earth Right Now?” More than 50,000 photos with hashtag #globalselfie were posted on different social media platforms - Twitter, Instagram, Facebook , Google+ and Flickr. On May 22, NASA released the 3.2 gigapixel Global Selfie mosaic based on views of each hemisphere captured by Visible Infrared Imaging Radiometer Suite instrument on the Suomi National Polar-orbiting Partnership (NPP) satellite on April 22. You can scan and explore the mosaic here. The campaign is an effort to shoo away the notion that Vodka means ‘premium’ and ‘exclusive’. It includes an online film and six 30-second spots that position the brand as vodka for everyone. The campaign with the tagline ‘Exclusively for Everybody’ echoes the brand’s belief “exclusivity for a few is less fun than good times for all”. It has also partnered with Spotify for a digital contest "Ultimate House Party" where users have to submit songs perfect for a houseparty. Prizes include "ultimate house parties" thrown in the winner's home town. The Oscars selfie is the most retweeted tweet of all-time. Featuring Jennifer Lawrence, Meryl Streep, Julia Roberts, Brad Pitt, Kevin Spacey and Bradley Cooper ( who took the picture) received 1,300,000 retweets in less than an hour. The previous top tweet was President Obama's victory photo from the night of his re-election. It racked up more than 780,000 retweets. More to come in our next series.